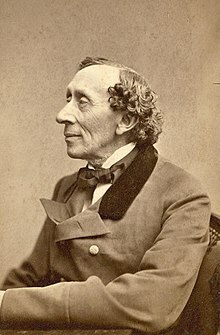 Ioannes Christianus Andersen (Danice Hans Christian Andersen seu H. C. Andersen, natus Othaniae die 2 Aprilis 1805; mortuus Hafniae die 4 Augusti 1875) fuit auctor Danus. Notissima suorum operum scriptorum sunt puerorum fabulae, quamquam etiam mythistorias phantasicas, poemata, librosque itinerum scripsit. Dalager, Stig. 2006. Journey in Blue. Mythistoria. Londinii et Toronti: Londinii: McArthur & Co.
Manning-Sanders, Ruth. 1949. Swan of Denmark: The Story of Hans Christian Andersen. Heinemann. Norton, Rictor, ed. 1998. My Dear Boy: Gay Love Letters through the Centuries. Franciscopolis: Leyland Publications. ISBN 0-943595-71-1. Terry, Walter (1979). The King's Ballet Master. Novi Eboraci: Dodd, Mead & Company. ISBN 0-396-07722-6. Wullschlager, Jackie (2002) . Hans Christian Andersen: The Life of a Storyteller. Sicagi: University of Chicago Press. ISBN 0-226-91747-9. Zipes, Jack (2005). Hans Christian Andersen: The Misunderstood Storyteller. Novi Eboraci et Londinii: Routledge. ISBN 0-415-97433-X. Vicimedia Communia plura habent quae ad Ioannem Christianum Andersen spectant. Novissima mutatio die 18 Ianuarii 2018 hora 13:42 facta.